The 107-Pc. 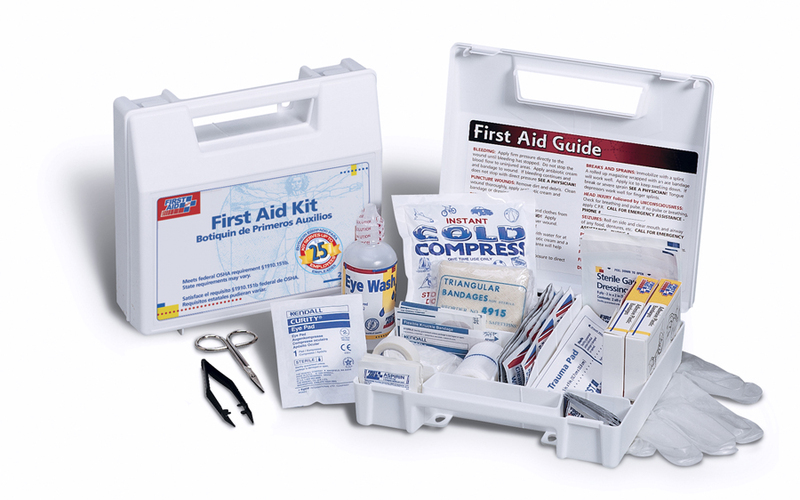 General First Aid Kit (9" x 8-3/8" x 2-1/2") is ideal for contractors, fleet vehicles, worksites or small companies with up to 25 employees. It meets federal OSHA recommendations and carries 17 critical products including a 4 oz. eye wash. The partitioned, water-resistant plastic case is wall mountable yet has a handle for easy carrying. The 203-Pc. General Workplace First Aid Cabinet (13" x 14" x 4-1/8") helps eliminates disorganized and missing supplies. Clearly labeled compartment creates a cabinet easy to use and restock. With expansion pocket, you can customize your cabinet to meet your specific needs. Simple but effective system for recording and restocking. Contents: (10) Patch plastic bandage, 1-1/2" x 1-1/2"; (25) Fabric bandage, 1" x 3"; (25) Plastic Bandage, 3/4" x 3"; (10) Knuckle fabric bandage; (1) Elastic bandage wrap; (10) Butterfly wound closure; (1) Triangle sling/ bandage, 40" x 40" x 56";(10) Gauze dressing pad, 2" x 2"; (1) Conforming gauze roll, 2"; (10) Gauze dressing pad, 3" x 3"; (1) Conforming gauze roll, 3"; (1) Trauma pad, 5" x 9"; (20) Alcohol cleansing pad; (20) Antiseptic cleansing wipe (sting free); (10) Castile soap towelette; (10) First aid/burn cream; (10) Antibiotic ointment; (1) First aid tape, 1/2" x 10yd; (1) Scissors; (10) Moleskin (blister prevention, 2"; (1) First aid guide;(2) Exam quality vinyl gloves; (1) 3" Stainless steel tweezers; (1) CPR face shield and vinyl gloves.